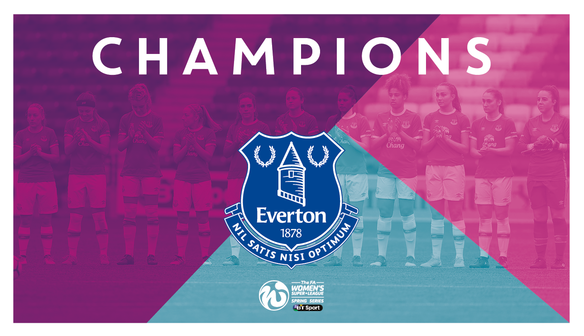 Everton have clinched the FA Women’s Super League 2 Spring Series title after a 4-0 win over London Bees at the Hive. The Toffees needed only a point to top the table but signed off in emphatic style with goals from Mollie Green, Michelle Hinnigan and a Claudia Walker double. London Bees almost took a shock lead when Sophie Fogarty’s inswinging free-kick crashed against the bar. After quarter of an hour, Aileen Whelan was put clean through but Bees keeper Sophie Harris produced a fantastic save to keep the scores level. Everton finally found the breakthrough on 28 minutes as Mollie Green’s deflected shot wrong-footed Harris. The lead was soon doubled as captain Michelle Hinnigan looped a header into the far corner from Danielle Turner’s cross. Hinnigan was denied a second just before half-time when her edge-of-the-area strike was blocked by the Bees keeper. However, Everton dominated the second half and Green almost added another, but her header from Turner’s cross was well saved. With 70 minutes gone, substitute Walker was tripped as she drove into the box, and she converted the subsequent penalty. And with seconds left, Walker fired in from 20 yards to round off victory for the newly-crowned champions. “The title is amazing for us. The short-term aim we had was to win the Spring Series and we’ve done it. “We’ve come away to London travelling, we’ve got tired legs – everything adds up – but the girls have been brilliant today. “Everyone who came off the bench, the whole squad; they’ve been really impressive this season. “Over the past five or six games, we’ve really dug deep and shown other teams what Everton can do. “I think it shows teams what we’re about. The average age is about 23. I think, for the girls, it’ll be a big experience and we can only take it on to next season. “It just goes to show that we’ve got competition now, which perhaps we didn’t have before. “Everyone’s on it, from Tuesday training through to Friday training. It’s good for us because we know there is someone behind us trying to grab our shirts, which pushes us harder. “We’ll celebrate. We’ve got a fitness test next week but then it’s a month off. “Congratulations to Everton on their title. “We need to go away now the Spring Series has finished, see where we need to improve, and build on it. “We started the season really well, but a few players picked up long-term injuries and we’ve had a few distractions along the way. We need to pick up the pieces as a team and go again next season. “This season has given players the chance to play, whereas maybe they didn’t last year. We’ve also been able to introduce new players and young players, and put them into competitive games to see how they play at this level.